Most of the picture book reviews I write are for, as you might expect, kids. That's not to say you won't enjoy them too, but I'm sharing them because, first and foremost, my kids liked them. But today it's just the opposite. Sure, your children might like these books (my kids love them), but I'm sharing them for all you moms out there. However, if you're looking for sugary-sweet books about the loving relationships between mothers and children, this is not the right list. Just head on over to the bookstore--those are the books that will have their own display table. 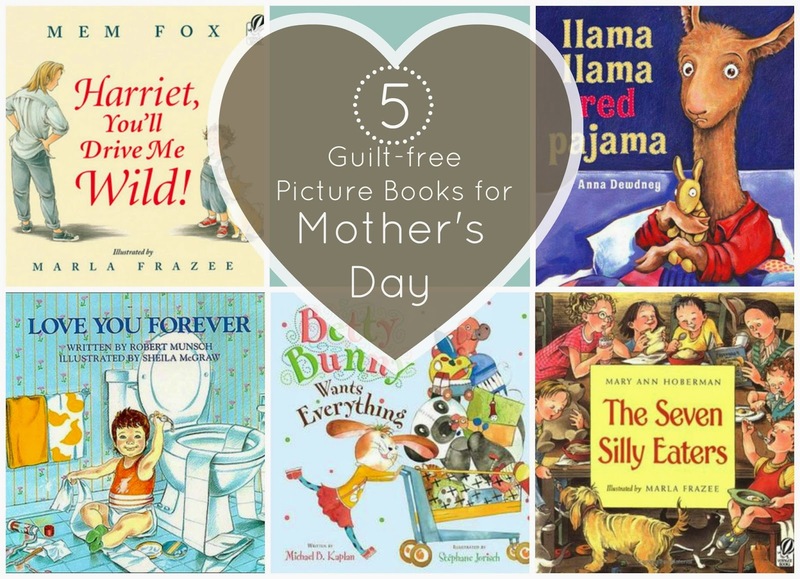 For the rest of you, here are five picture books that help me feel better about being a mom. They feature authentic scenarios and believable dialogue, and they bear an uncanny resemblance to real life . . . at least, my real life. Confession: It's only spilled milk, but sometimes I lose my cool over spilled milk. If you do too, then you'll be able to relate to Harriet's mom. Harriet is a pretty typical three-year-old (it never expressly says anywhere that she's three, but from her looks and the activities she's engaging in, she's three). She doesn't necessarily try to make messes, they just seem to follow her around. At breakfast, she turns upside down in her chair and knocks over her juice, which dribbles onto the dog. Later in the day, she paints a picture and doesn't wait for it to dry before she runs to show it to her mom--and consequently, paint runs all over the carpet. You can tell that Harriet's mom starts out the day with the best of intentions. She doesn't like to yell, and so with each mess, she tries her hardest to stay calm and patient: "Harriet, my darling child . . ." But her patience gets a little thinner each time until finally, when Harriet rips open a feather pillow during nap time, she completely loses it. She yells and yells and yells. And oh, how I can relate! I'm convinced that I begin the day with a prescribed amount of patience. Sometimes it can stretch until five o'clock, but if too many things drain it, or I don't get my hour or two of quiet time in the afternoon to replenish it, then I act very similarly to Harriet's mom. I'll give you an example: Monday was fairly typical - Clark clung to my legs and whined, Bradley jerked his bowl off the table (one of those suction cup bowls--great in theory, horrible in practice) and spilled milk and cereal all over, the boys bickered and fought, etc. I felt little twinges of irritation but stayed calm. Then, during quiet time, I heard the unmistakable sound of shattering glass. I walked into Maxwell's room and found that he'd thrown a pillow at his light (apparently, he was trying to get a ladybug off of it), and it had broken into hundreds of shards and pieces. But still, I didn't lose it (mostly because I was just so incredibly grateful he hadn't gotten hurt). It wasn't until it was time to pick up Aaron from school and we were running just a couple of minutes late. I hurried the kids out to the van and found it in a complete state of chaos. Every carseat was unbuckled and turned over, the driver's seat was completely reclined, and the mirror was totally skiwampis. And then I lost it. I knew, of course, that Max and Bradley had been pretending it was a rocketship earlier in the day, but I had completely forgotten to go put it back in order. Now I was up against the clock, and I can't stand being late. Like Harriet's mom, my patience was gone. The wonderful thing about this book though is that it shows the explosion but then the resolution. After Harriet's mom gets through yelling, she takes a deep breath, hugs Harriet tight, and says she's sorry. This is a good book for my kids to read because it reassures them that moms have hard days, too. And on the drive over to school (we were late), I said I was sorry, too. I've loved the Llama, Llama series for many years, but this one strikes a particular chord with me. Mama Llama puts Baby Llama to bed. She reads him a story, snuggles with him, and gives him a kiss on her way out. Then she begins to get some much-needed work done. Within minutes, Baby Llama feels alone and wants the never-fail request: a drink. He calls down to Mama, she calls back that she'll be up soon. But of course "soon" for an adult is not the same as "soon" for a child, and pretty soon, Baby Llama is weeping and wailing, shrieking and screaming for his mama to run to him. I've had this exact same experience dozens of times. My five-year-old, Maxwell, is the #1 culprit of the "ceaseless shrieking method." Invariably, he always employs it when I'm putting Clark to sleep or on the phone or otherwise occupied and unable to call back to him without further damage. My favorite is when he does it in the middle of the night, and his shrieks pierce the quiet stillness. Mama Llama's response? With hands on her hips, she scolds, "Baby Llama, what a tizzy! Sometimes Mama's very busy." She admonishes him to be more patient and then tells him that she loves him. It ends on a very sweet note, and as with Harriet, You'll Drive Me Wild, I love the conflict and resolution that's portrayed. Are you surprised that this one is on the list? This is probably considered one of the "classic" Mother's Day picture books and falls into the sappy category (either that, or disturbingly creepy--you decide). But I'm not including it for either of those reasons but because I am this mother. During the day, my kids sometimes drive me a little crazy (that picture of the little boy in the bathroom with toilet paper stretching across the floor, getting ready to chuck his mom's watch down the toilet? That is Clark to a T right now). But for all the craziness, I fiercely cling to my kids' childhoods. I resent their birthdays because they're growing up too fast. And every night, without fail, I go into their dark bedrooms and kiss their soft cheeks and put my hand on their backs to feel their slowly rising breaths. If I wake up in the middle of the night, I have to go give all four of them a quick check before I can go back to sleep. That's all fine and normal (right? I don't think I'm alone with wanting to see their peaceful sleeping faces before I go to bed), but I don't like to admit how much I'm already dreading the day when each of them leaves home and lives on his own. It's going to be hard to give them up, and I'm just a little worried I might be tempted to strap a ladder to my car and drive across town in the middle of the night. Luckily, we still have many years ahead of us, and I think the transition will be gradual enough that I'll be ready for it when it comes. But I'm just a little worried . . . I've talked about Betty Bunny before (in Betty Bunny Loves Chocolate Cake), but there I focused more on Betty Bunny herself and also her older brother, Bill. This time I want to talk about Betty Bunny's mother. In this story, she takes her four children to the store and tells them that, as a special treat, they may each choose one toy. (Bill's response is priceless: "I'll just take the cash.") Betty Bunny is overcome by all of the amazing toys she sees, and she starts piling the cart with them. Even though Henry and Kate and Bill and their mom all try to stop her, she won't listen (which leads Bill to say, "Keep acting crazy. It makes the rest of us look good"). Finally Betty Bunny's mother says that if she can't decide on one toy, then she won't get any toys. She sticks to her guns, and picks up a screaming, crying Betty Bunny and marches out of the store. I can empathize with her, to be sure, but I'm also so inspired by her. She doesn't pay attention to the looks being thrown her way from the other customers. She knows this is something she has to nip in the bud, right then and there, or this will be a problem every time they go to the store. She remains unflustered when Betty Bunny calls her the "meanest mommy in the whole world," and she and Betty Bunny's dad come up with a wise and calm solution. I love Betty Bunny's mother's quick discipline; I love the way she turns an unpleasant (even embarrassing) situation into a teaching moment; and I love the teamwork and unity between her and Betty Bunny's father. This book makes me feel better about being a mom--not because I'm always as calm and collected as this mom in the face of tantrums but because I believe that with practice, I can be. This might well be my favorite picture book of all time. It makes me a little nervous to make such a declaration, but I honestly can't think of another book that tops it. I like it so much that I bought it for myself, not for my kids (although I do let them look at it on occasion). And the reason I love it so much? Well, I love the text (MaryAnn Hoberman's rhymes are gold), I love the illustrations (I've said before that Marla Frazee is my favorite illustrator), and I love the story. But mostly, I love Mrs. Peters. Here she is with her seven children, trying her hardest to please each one. She is like a short-order chef giving Peter his perfectly warm milk, Lucy her homemade lemonade, Jack his applesauce, Mac is smooth and creamy oatmeal, Mary Lou her soft and squishy bread, Flo her poached eggs, and Fran her fried eggs. And do they appreciate it? Not a bit. And finally, finally, Mrs. Peters can't stand it anymore. She is overworked and overwhelmed. There are dishes in the sink, bread is spilling out of the oven, the counters are crowded with eggs and milk, the cupboard doors are open, there's laundry (some of it folded, some in a basket) by the kitchen table, and Mrs. Peters is standing in the middle feeling like she has no control over anything. I don't have seven children, but I have four, and sometimes I feel exactly like that picture. I look around me at my disaster of a house, and I feel like I'm drowning. There's no way for me to get on top of the mess and meet the constant flow of demands. I know what it feels like to be so overwhelmed, the only thing I can do is go to bed and hope that things will be better tomorrow. And guess what? Just like when Mrs. Peters wakes up and finds that her children have not only remembered her birthday but made her a beautiful birthday cake, things often seem brighter in the morning for me, too. Who is your favorite picture book mother? Who do you relate to? Who inspires you? Please share in the comments! "Hog-eye" by Susan Meddaugh I love this book anyway for lots of reasons (reading to the rescue! ), but the parent's reactions to the story are hilarious. "Owen" by Kevin Henkes This one is also classic. I guess I can relate to little Owen, since I dragged a favorite "blankie" around for much of my childhood. After a little too much advice from the neighbor, his mom's inspired idea saves the day! Yes! "My Monster Mama Loves Me So" by Laura Leuck. Rather an unconventional Mother's Day book, but the rhymes are so catchy and the illustrations by Mark Beuhner all have hidden pictures to find. Oh, I found one more. Mrs. Potter in "Mrs Potter's Pig," by Phyllis Root. I really like how she discovers how to connect with her daughter, even though they're so different. I can't decide how I feel about Froggy's mom, from Jonathan London's books. I feel like I should probably be more like her and let my kids do their thing for better or worse, but in some of the books (Froggy Goes to Bed, especially) she drives me batty. Send the kid to bed already! Now I want to go through the books in my 7-year-olds' room, but he's not asleep yet. Maybe tomorrow! Thanks for a fun diversion! Linnae - thanks for all the fantastic suggestions! I've never heard of Hog-Eye or Mrs. Potter's Pig!